The Concerts for Kids! Program has constantly been a highlight of the SUWO calendar ever since the series began in 2007. 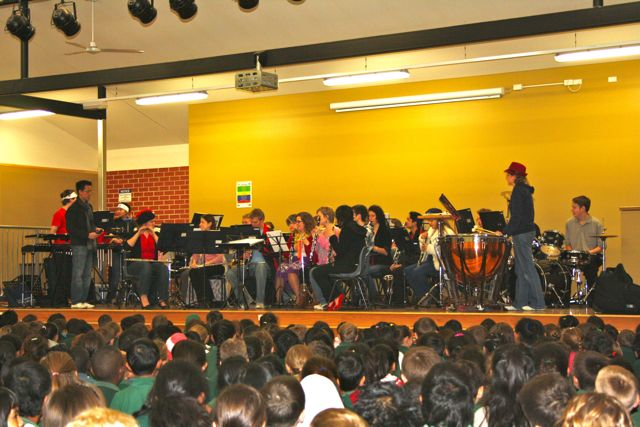 Each year the band is able to inspire hundreds of young children by providing free, themed & interactive concerts at various Sydney primary schools. 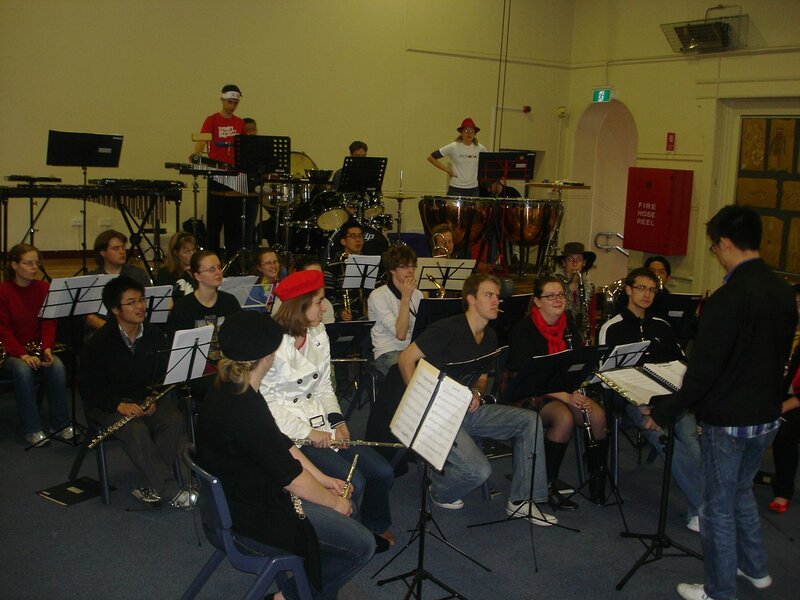 This year was no exception, as we took students on a musical journey ‘Around the World’ and introduced them to the sound and the instruments of the symphonic band. The concerts got off to an exciting start as students eagerly recognised tunes from The Simpsons and Pirates of the Caribbean. The question “did you like it?” was answered with a thunderous “YES!” at each school we visited. 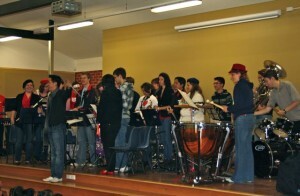 Next up was a journey to Africa, where some lucky volunteers were able to join the band’s percussion section. Students also had a chance to dance to a Jewish Folksong Suite, hear the sounds of Chinese & Japanese music, and learn about jazz and soloists as we performed Dixieland Jam. Another definite highlight was seeing the whole school, including the teachers, dancing along as we performed Big Fun in the Sun! What better positive feedback could there be? And of course, you can’t have an ‘Around the World’ theme without ending up back in Australia, and our rendition of Waltzing Matilda, arranged specifically for the concerts by our own member Liane Papantoniou proved to be a very fitting end to each of our performances. 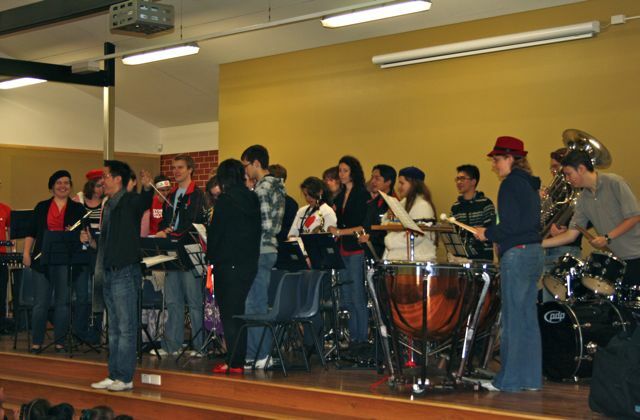 A highlight of the week was certainly our trip to two schools in Western Sydney – Colyton P.S. and St Mary’s South P.S. 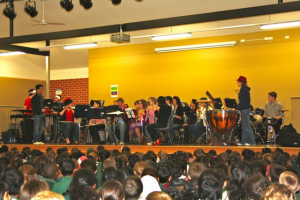 These are schools that normally have very little exposure to music, with many students never having had an opportunity to see or hear live instruments before. It was amazing to see the excitement and astonishment on the kids’ faces as we performed, and the way they reacted to the music. I’m quite sure that no member of the band walked away from those concerts without realising that what we do for these students can be truly inspirational. We have also received wonderful feedback from both these schools. St Mary’s South P.S. asked their students to reflect on the concerts, and we have since heard that only positive responses were written by the kids! The Assistant Principal mentioned that we have certainly “planted a seed” as a year 4 student asked how she could join a band after hearing us play. A teacher from Colyton P.S. also wrote to us to say that “all the teachers thought it was the best performance we’ve had at the school, EVER!! !” Quite a compliment from a school that was established in 1861! Many heartfelt thanks must go to our Musical Director, Adrian Tan, who programmed the concerts and enthused the kids with his energy and passion throughout the week. Thanks also to Sandra Horne, our Assistant Conductor for her great efforts inspiring the students at Darlington P.S. and to all the band members who gave up their holidays and other commitments to be involved in the concerts. It has been wonderful to receive such encouraging feedback from all the schools, and to know that what we do has so much power to inspire. Walking away from the last school performance and hearing kids in the playground saying that “instruments are amazing!” really epitomises what these concerts are all about.